This is a special guest post done in collaboration with Paul Archer of DronesGator.com. Are you wondering how you can increase your drone game and get incredible drone shots like those ones you keep seeing on YouTube? 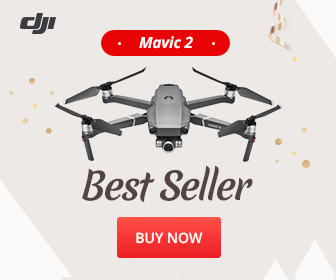 Or, maybe you’re simply looking for some ideas on how to improve your drone filming skills and create interesting drone moves in your work that are more dynamic and cinematic? Then check out these 7 Amazing Drone Shots which usually serve as my “go-tos” for almost any video project I do. If you master these cinematic moves, your drone videos are guaranteed to have a more professional look. Now I have to say you’ll be able to do most of these with ease even the first time, but mastering them is another story, so the key is to practice, practice, practice to make sure each move is smooth and controlled. First, let me give you a few pieces of advice when it comes to picking a camera drone. If you haven’t yet piloted a quadcopter and want to start with something more budget friendly, I’d recommend a camera drone that’s under $200 so you first master the basics of flying, learn drone safety and camera control without crashing something expensive while you’re learning. This shot puts an emphasis on the separation between the main subject and the background while also serving as a reveal shot. This shot is all about showing depth and in terms of storytelling, it can be used to reveal a character’s future path or hardship (maybe use a tall mountain as a background with a road or path leading towards it). This shot can be used for filming a music video – Put the band in a beautiful landscape with a mountain behind. When flying towards them, it will seem like the band is approaching the camera very fast while the mountain is still, which will create a beautiful contrasting effect. This is the most basic move I can think of, but the results are always interesting. The success of this shot is very dependent on how you frame your shot and what you plan to reveal so think about that first. Simply point your camera down, and then slowly move your camera’s gimbal up while moving forwards or backwards to reveal a landscape. You can do the reverse: Fly towards a landscape with the camera forward (an ocean for example) and then tilt your camera down to focus on the people on the beach or maybe a group of people. This one can be both hard to do, if you do it manually or it can be easier if you’re using the automatic smart flying modes found on most modern drones. You slide left or right from your subject while rotating the drone so it always faces the point of interest. Basically think of orbiting around a subject, just like how the earth orbits around the sun. How to do it automatically: Most drones over $500 have a smart mode option included that you can activate with a touch of the button and you can simply pick the distance from the object and it will fly perfectly in a circle around that point. If you have a DJI drone like a Mavic, Spark or Phantom then try playing with the intelligent flight mode called “Point of Interest“. Remember that you aren’t supposed to do a full 360 circle around an object. That might become boring for the audience. It’s enough just to fly a little while keeping the subject in the middle to focus on its importance or beauty. Flying around a Lighthouse (I think I love the sea too much, lol) – Circle around it with the sea behind or even the land. You should also try doing this at night when it’s lit, but remember to ask for permission first! Do this around a friend who is walking or even standing still to create a “inside the mind” effect that will draw the viewer closer to the subject and play towards the story. This is one of those shots that are also excellent for photography but it can work just as well for videos since it is a perspective rarely seen. Put your drone at a certain distance in the air, and with the camera tilted downward fly in any direction. You can also just stay in place and let the action unfold down below, or just slowly move forward, or backward, or side to side. Other great examples can be see here and here. Maybe take a shot on the beach with many umbrellas next to each other revealing a beautiful pattern with the ocean waves creating a nice motion. Capture a person or group of people laying on their backs in a field of flowers or another picturesque place where the wind is slightly moving the flowers back and forth. Split the frame in two, showing part land, part water where you create some nice contrast with something static and something that moves. This one is also simple to execute but if used properly it can have a very powerful effect. This is basically a combination of the The Overtake and the The Tilt Reveal move. In the example above the foreground is the first hill you see and the background is all the windmills, sky and sun. The actual “unveil” then is when I fly over the foreground to reveal the background in its full glory. As an added dramatic effect the sun’s flare blast the frame as the drone climbs over the hill. The key is to start flying low so you just see just the foreground and then you begin increasing in altitude until you can see the entire background layer. Fly slowly in parallel with a building, to introduce the place where an event takes place. Capture a sunset between trees or buildings and the rays shining on and off while you move parallel to the sun. This side follow shot is one of my favorite shots to film with my drone. As you may know, most newer drones have a follow me feature that are able to follow people and objects that you select on your controller’s screen. You can do this by moving the drone parallel to your main subject and tracking the subject whole time. The goal is to track your subject the whole time. One main thing to practice is to keep your subject in the same spot on the screen for as long as you can. This gets harder as you move further away from your subject or when the subject changes directions. To make this even more interesting try it while adding a move like lifting into the air to get a more dynamic effect. Follow a moving car that enters the frame to introduce a character or simply make a car presentation. You can do it while flying at the same speed as the car and keeping the car in the center of the frame or along one of the rule-of-thirds intersection points. Or you can fly at a slower speed and let the car pass fast through the frame to highlight its speed. Take a cinematic shot with somebody jogging or running in slow motion from the side to add depth and interest to your video about a person’s fitness journey. Follow a boat close to water while catching the sun’s reflection in the water. I know I said all these shots would be easy to do, but this one is simply too good to not share. You basically do a point of interest move while raising or lowering the drone. This creates a helix-like shape around a certain object or person. This move can also be found as an automatic flight mode in DJI drones but like all these moves its best to learn how to do it without just replying solely on the drone’s software. Reveal past a mountain – This can be used while getting a mountain/wall /forest in the frame at first and rising around it to reveal a landscape behind. Helix around a tower/tall building – if you have a tall structure, it’s best to capture it entirely with this close up shot. Reveal a character journey – Start flying from the front of a character and go around and above to reveal what was in front of him all this time. Well that’s it. I hope you learned something and are inspired to get out there and practice some dynamic drone filming moves. Don’t forget to write these down or bookmark them so you can practice them over and over until you’ve mastered each one. If you manage to do these smoothly, your videos are sure to skyrocket to another level. Let us know in the comments below which move is your favorite or if you have a favorite move you would like to share with the #fromwhereidrone community! Paul Archer, drone enthusiast and owner of DronesGator.com and currently creating helpful drone videos on his DronesGator YouTube channel. The Tilt Reveal, Bird’s Eye and Helix videos come out as broken links. Is this just on my end? Hey, Frank. On my end everything looks good. Could you please try on a phone or another computer? After I submitted my message and scrolled from the bottom to the top, all the missing videos filled in. Must just be my computer. Thanks Paul and a Merry Christmas. Enjoyed this quite a bite Dirk!